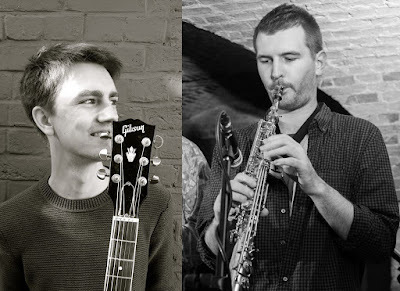 LondonJazz News: You are presenting a double bill gig - how do you decide which band goes first? Matt Sulzmann: Billy's band is up first. The instrumentation of the two bands is the same except that mine has saxophone added, so in that sense we thought it made sense to have the larger band on second. Billy is also playing in both sets so I'm sure it will be nice for him to be able to relax a bit more in the second half. LJN: Do you both play in each others bands ? Billy: I've been playing in Matt's quintet since the start of January and I'm excited to do my first gig with the band. Matt: Still waiting for the call from Billy...! LJN: Who else is in your band (s)? Billy: My quartet features Rupert Cox on piano, Joe Downard on bass and Ben Brown (leader of the band Waaju) on drums. Matt: My band has Billy on guitar, as well as Will Barry (piano), Flo Moore (bass), and Dave Storey (drums). LJN: Who are your composing and playing idols ? Billy: My composing idols include Django Bates and Wayne Shorter and some of my playing influences are John Scofield, Kurt Rosenwinkel and Louis Armstrong. This project in particular is inspired by the likes of Kneebody, Wayne Krantz and Louis Cole. I aim to write exciting rhythmic music that explores evocative melody and harmony. Matt: I grew up going along to gigs with my dad and in particular his band "Neon" made a real impression on me both in terms of playing and composition; there's a great sense of joy in the writing that I've tried to capture in some of my own music. I've got fond memories of hearing lots of other great UK players/composers as a youngster too, people like John Taylor, Kenny Wheeler, and Nikki Iles. More recently I have been getting into players like Kurt Rosenwinkel and Will Vinson, and I've also always loved Bill Evans, Stan Getz and Zoot Sims. LJN: Have you heard each other's bands before? Billy: Yes, I've heard Matt's quintet at the 606 and Basement Bar, I really admire his composition. Matt: I heard what I believe was the first outing of Billy's quartet at the Basement Bar. I was impressed by how personal/unique a sound the music had as well as how exciting the compositions were. LJN: Does this gig have any personal significance? Billy: This is my first gig as a leader at the vortex. I've been doing a lot with my octet recently, so I'm looking forwards to an outing with my quartet. Matt: Its been a little while since I took a band out and I'm really looking to playing new music with these guys. Leading a band at the Vortex is a first for me too. LJN: Any plans for these bands after Feb what news should we be looking out for? Billy: I will be recording my quartet later in February and the Billy Marrows octet is at the Jazz Nursery on April 27th performing highlight for my suite exploring ideas from gamelan, written for the Lancaster youth jazz commission, alongside new music I'm currently writing. Matt: We will be playing the Green Note in Camden on October 1st, with hopefully some more dates in between. LJN: Billy, you've just won the Richard Turner T prize. Congratulations - how does it feel and what does it mean? Billy: Thank you! I feel very honoured. Richard Turner was an inspirational musician and member of the jazz scene and his family's generous grant presents me with a fantastic opportunity to develop my own creative projects further.